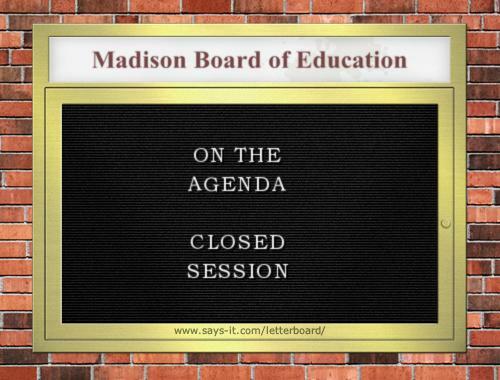 The main Madison Metropolitan School District Board of Education meeting this week will be in closed session. There are some other Board related meetings this week that are open. The full notice of all the meetings is here. There are very specific statutorily required procedures for renewal/non renewal deliberations and a closed session is part of them (a non-renewed employee may request a subsequent public hearing). I’m not sure on the closed session “potential reorganization” discussion as a legal matter or as policy. Not feeling qualified to offer much more than my doubts on the legal issues, I’ll stick to policy, where everyone is qualified to offer an opinion (ain’t America grand?). There are two parts to the policy issue. The first is whether all discussions of a potential district reorganization should be had in public. I think they should. I think the public should know what our employees and our elected officials are saying about the current organization and how it might be improved. I always side on more openness. The second is whether decisions about the structure of an organization of the size and complexity and MMSD should be based on the skills, knowledge, competencies and incompetencies of current employees. I think the answer is no. If these are not part of the decision-making , then there is no reason (certainly no legal justification) for a closed session. Employees come and go and can be let go (in Wisconsin administrator contracts are limited to two years); the district goes on. Plugging individuals in or unplugging them is not a long-range organizational strategy. Decide what works from a structural point of view and then find the people for the slots. If current employees don’t fit the slots, they should not be renewed, but defining the slots should be prior, separate and public. Even worse is designing the slot to fit an individual’s skill set. The individual will not be there forever and then the organization has an unfillable hole. So I’d like an open session on reorganization, hope that nothing substantive of the reorganization is discussed in closed session and understand the need for closed sessions on employees. Maybe I’m just curious about the reorganization. For the other meetings, on Tuesday at noon there is a meeting of the ad hoc Board Committee on revising the Ethics Policy (nothing linked the week, but this from last week); on Wednesday at 8:00 AM the School Food Initiative Committee will discuss ‘”Lunch Lessons” covering all aspects of MMSD food service” (I can’t find any official reference to this group except this from the week of January 25 meeting notice); and on Thursday at 1:30 (at building services on Plaum Rd), the 4-Year-Old Kindergarten Subcommittee on Curriculum will meet. The first thing on the agenda for the last is “Open Meetings Laws,” and that’s a good thing. N o info on the sub-committee, but the main 4K page is here and the Advisory Council page is here (with only the January 26 minutes posted, although they have been meeting for over a year). I do want to note that the times and/or locations of these meetings are not the most accessible. That will happen sometimes but you want it kept to a minimum. I guess the theme this week was open governance, open meetings and open records. I’m glad to make that the theme, these are essential to democracy. One good thing about the school governance schedule this week is that everyone can make time to attend the Progressive Dane School Board Candidate Forum, Sunday February 21, 1:30 PM at JC Wright Middle School, 1717 Fish Hatchery Rd. (info, fliers to print and post, and more, here). See you there!